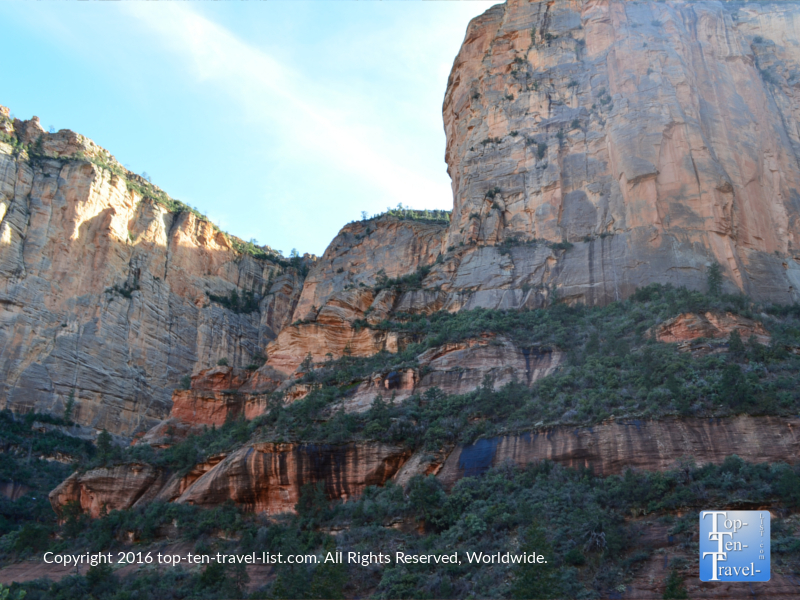 A Crazy Winter Adventure through Beautiful Boynton Canyon - Top Ten Travel Blog | Our experiences traveling throughout the US. 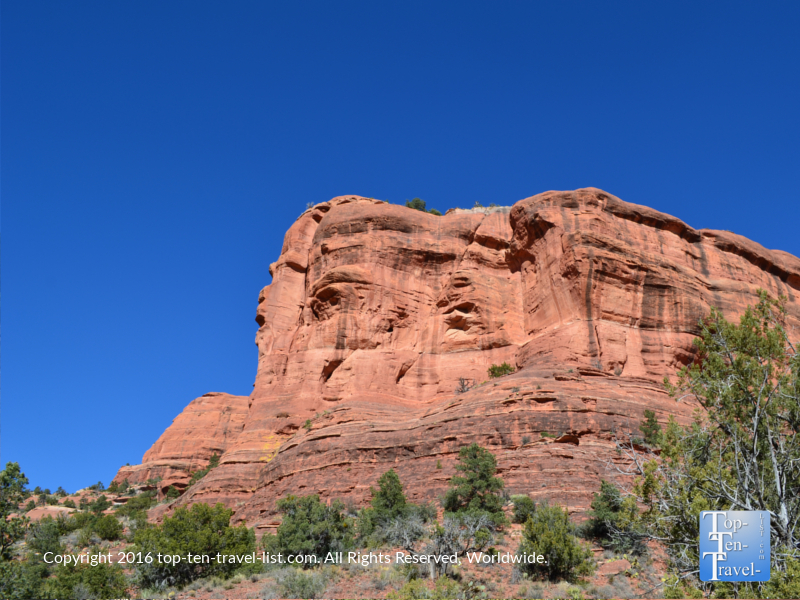 Boynton Canyon is a visually spectacular hike to a large box canyon, a beautiful Sedona trail offering an attractive mix of desert and forest scenery. In addition, it is famous for being one of 4 major energy vortex sites (more about vortexes later on). Whether or not any special energy actually exists here, anyone who walks the full trail will definitely agree that something special is in the air. Hiking Boynton Canyon truly is a mesmerizing experience, both for the amazing views and peaceful natural surroundings. Diverse plant life, weird temperatures changes, and unique red rock formations make this 6 mile round trip journey one of the most interesting in all of Sedona. Boynton is one of my favorite trails in the area because it looks so green year-round and offers the most drastic changes of scenery. 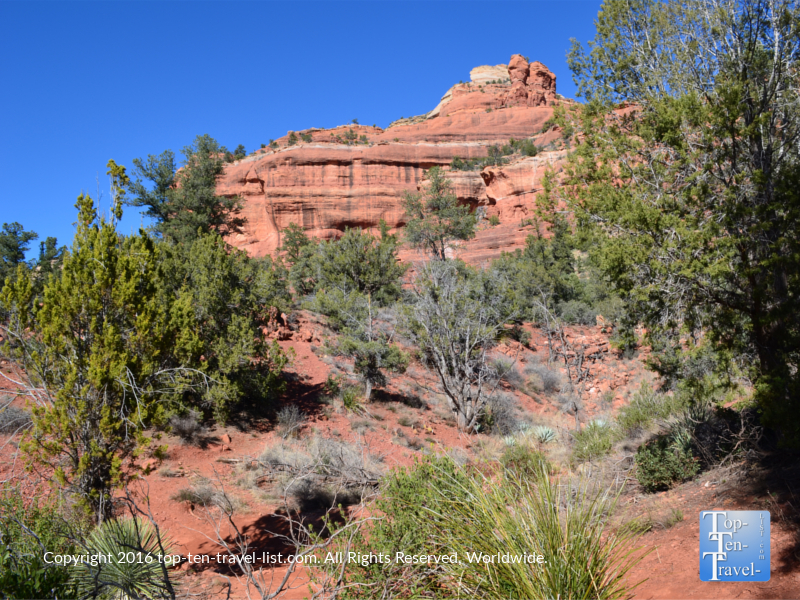 It also happens to be one of several trails located in the gorgeous Red Rock Secret Wilderness, a lush 47,195 acre section of the Coconino National Forest. Many diverse varieties of plants and dozens of wildlife species including black bear, mountain lion, javelina, and elk are occasionally seen. 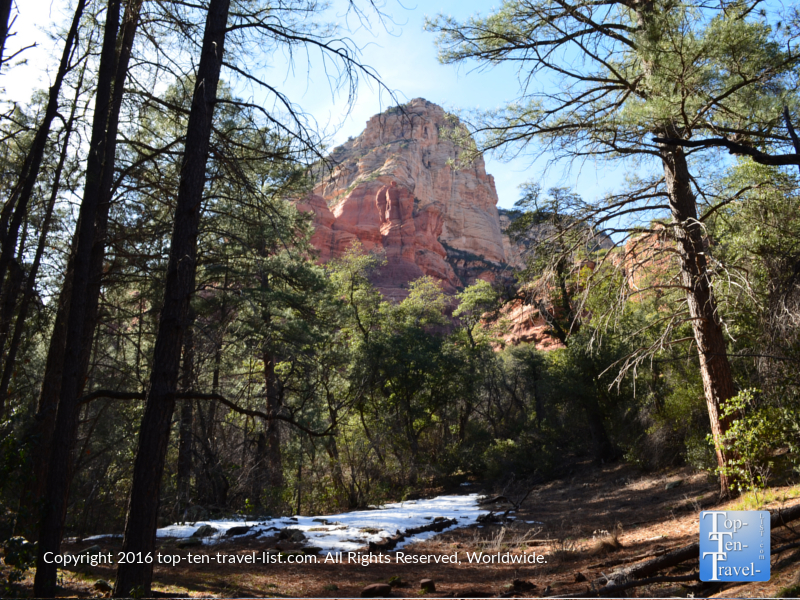 I’ve yet to see any wildlife on this or any other Sedona hike, however, I am always on the lookout! Boynton Canyon is one of the most unusual trails in the area, especially if you visit in the winter after a major storm. From the hot, open desert vistas near the beginning of the trail to a very shady, oftentimes snowy and icy trek in the 2nd half of the trail, you really as if you are in a different world. It’s like going from summer to winter in the matter of an hour or so! 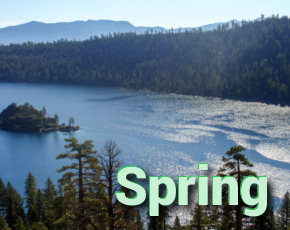 The portion of the trail which enters the Upper Canyon offers a drastically different setting from the start, consisting of shady skies, really cool temperatures, and thick ponderosa pine forests. 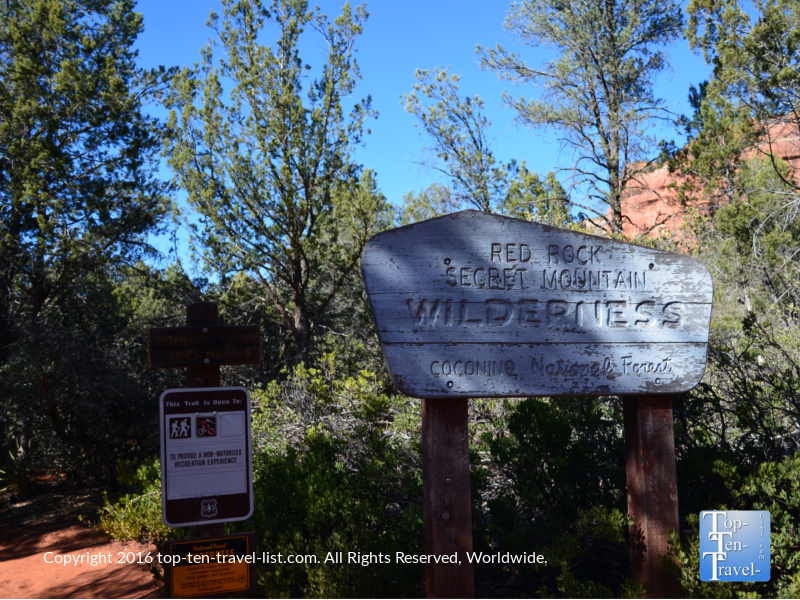 You will not see as many red rock views, however, the quiet trek into nature is very rejuvenating. Unlike the open desert section of the trail, this portion tends to stay snowy and icy for much longer after a storm due to the shade. 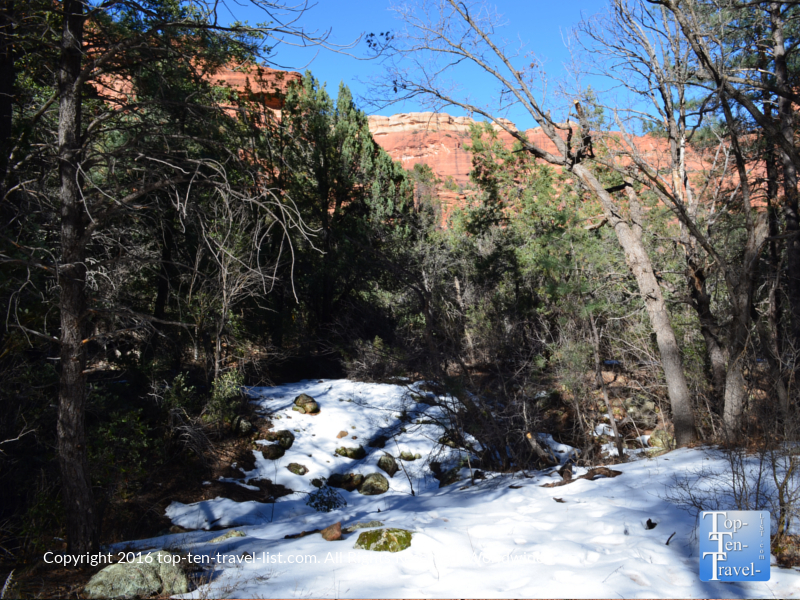 You will see many hikers turn back as soon as they start to see the snow and ice, so if you choose to continue on, you will enjoy a solitary experience into the Sedona wilderness. The scenery is gorgeous, almost with a mysterious vibe, and perhaps this is why it is considered a vortex site. Temperatures started off around 80 near the beginning and appeared to drop by at least 30 degrees near the 2nd half. I recommend dressing in layers if you wish to continue on. 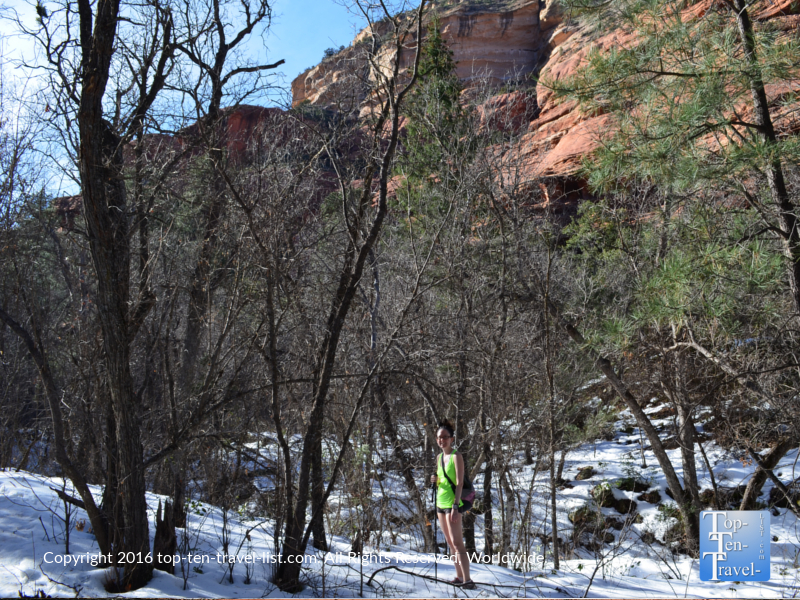 Having started the hike in shorts and a tank top, I was absolutely freezing (for almost 4 miles!) once we entered the unexpected shady section. The 3 mile journey ends with a short climb up to an observation area, where you will experience fantastic views of the large box canyon. It really makes the trek through the ice and snow worth it! Relax and celebrate your long journey with some quiet views of this natural wonder before embarking on the 3 mile return journey. Although the 6 mile RT journey is quite easy in the summer, it is another experience entirely after a storm. Also, it’s quite time consuming (about 2 hours or more), so bring plenty of water and snacks to power you through. And most importantly dress in layers, as you never know what the temperature will be inside the canyon, despite the warm, sunny skies in town. Overall, Boynton Canyon is definitely one of the top trails to check out during your Sedona visit. If you are a new hiker, dislike snow and ice, and/or are limited on time, then I would suggest waiting until the summer season. 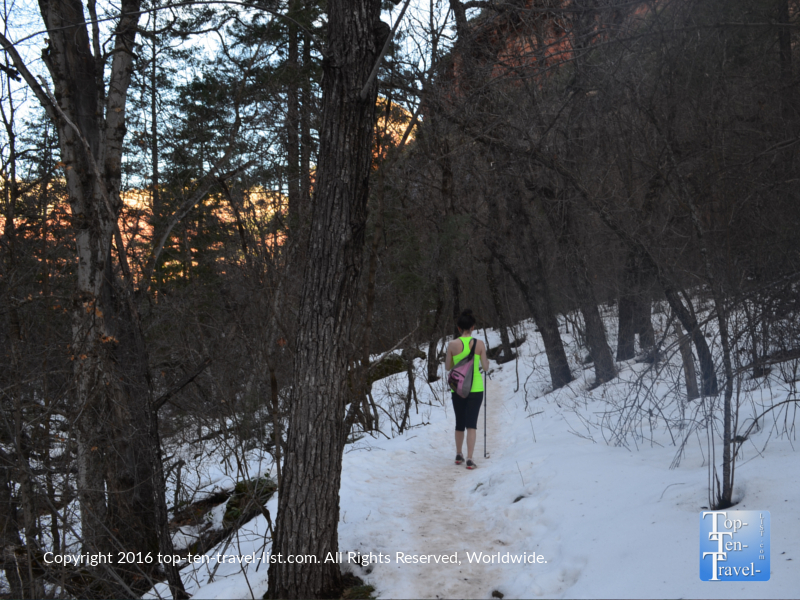 If you do choose to hike in post winter storm conditions, be sure to take extra precaution by dressing in layers, carrying extra water, wearing shoes with extra traction, and carrying a hiking stick for extra control. Vortexes are believed to be the highest energy sources on the planet. 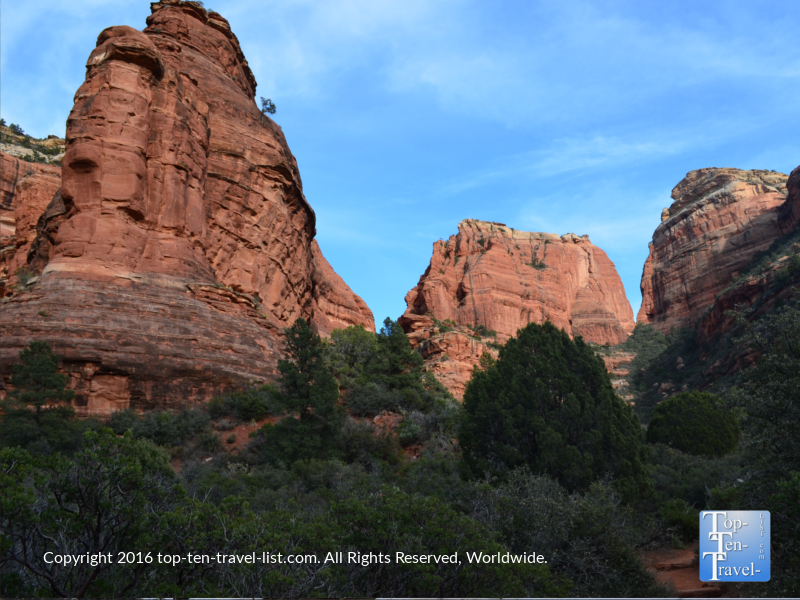 Sedona has become very popular for its 4 major vortex sites, which include the Boynton Canyon Trail, Airport Mesa, Cathedral Rock, and Bell Rock. Visiting any of these vortexes is supposedly beneficial for your health and well being. Many people report a feeling of enhanced peacefulness, making meditation even more beneficial. You will see many Juniper Trees along these vortex hikes. These strange looking trees are supposed to contain the strongest energy, as evidence by their spiraling effect. 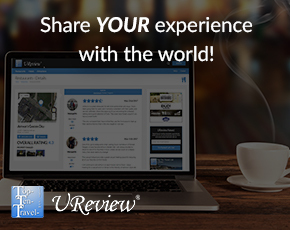 Whenever you come across a vortex site, healing and meditation are considered most beneficial. There is nothing physical to be seen, yet proponents claim to sense or feel something when they come in contact with a vortex. Vortexes can be either masculine (yang) or feminine (yin) in nature. Feminine sites are said to strengthen traits like kindness, while masculine sites are said to strengthen characteristics like self confidence and problem solving abilities. Boynton Canyon is known to possess a combination of both energies, known as a yin/yang balance. If you want to learn more about vortexes, you can sign up for a Sedona Vortex Tour while in town. Sedona’s serene landscapes and peaceful atmosphere has made it a very popular home front for spiritual healers, psychics, massage and yoga practitioners, and many other New Age gurus. If you are interested in the New Age movement, you will find more than enough activities to interest you during your stay in Sedona! Directions: Drive on 89a through Sedona until you reach Dry Creek Rd. Turn right on Dry Creek Road near the Enchantment Resort. Here you will find the parking lot. Arrive early as the lot is often full! Parking: A daily Red Rock Pass ($5 or purchase the annual for $20) or annual America the Beautiful pass is required to park. I highly recommend an annual National Park Pass ($80) as it often pays for itself in just a few short months!